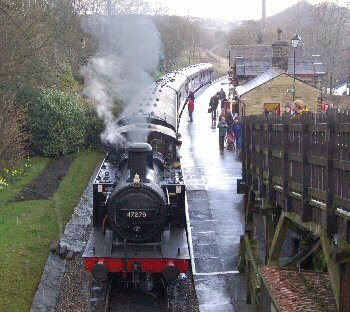 It’s been a while since I went to Howarth and onto the steam train on the Keighley and Worth Valley Railway, but I’ve just got around to writing a post about it. So when we visited our baby was still quite young, and very much dependent on warm food for lunch. We started the visit at Howarth, famous as home of the Bronte sisters. There is a large tiered public car park that we parked in. If you are taking a baby in a pushchair then you need to be aware that the path at the top of the car park is not suitable for push chairs. We actually took one through, but it involved lifting the whole pushchair (complete with baby), over the top of a large stile. The middle tier includes a path suitable for the disabled, and I recommend you take that instead. We didn’t spend long in Howarth although it would be a good place to start out, and return to if you wanted to visit the Bronte parsonage. We headed down the hill, and through the park to find the station at the bottom of the hill. After first checking that there were trains running at a suitable time we bought a round trip ticket from the station. There is a small shop in the station. The train we were due to take was over lunchtime, and we needed to feed our baby, as there was a buffet service on the train we planned to warm the baby food up there. Unfortunately they did not have any hot water. The train could provide beer, but not hot water to warm a baby bottle up with. We had got on the train when it was going in the direction of Oxenhope. The train would then turn around and take us back past Haworth towards Keighley. We were planning to stop on the train, but as we’d not been able to warm up the food for our baby I got off the train armed with baby food, and headed towards the cafe (with about 15 minutes before the train was due to leave again). The cafe is in the form of an old train buffet car. At first they said that they didn’t have any facilities to warm baby food in, but in the end they did give me a teapot full of hot water. So we were finally able to give our baby slightly warmer food although the time available was not enough to heat it as much as we would normally do. We then remained on the train for the rest of the journey towards Keighley. We got off the train at Keighley. We ate our lunch in the Sainsbury restraunt, where we also used the baby changing facilities. We then went on to look around the town. Five minutes later and we were wondering how we were going to kill the rest of the time until our return train. Needless to say there is not much in Keighley, there is a fairly large toy shop, but that is about it. In hindsight it would probably have been better to get off at Ingrow West station where there is the Museum of Rail Travel. We did not get time to look around the museum. The return journey was less eventful, and more relaxing than the outbound journey. Our baby fell asleep, so it gave me the chance to get my camera out and take some photographs. 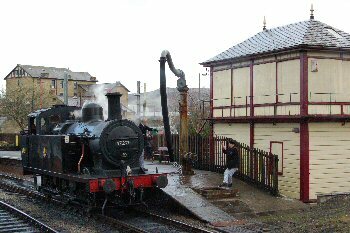 We arrived back at Howarth station, when it started raining. Driving away we noticed a sign to Oakworth station so we took a slight detour to have a look. We had passed through the station on the train. 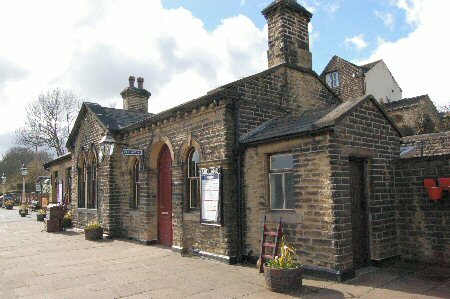 The station is particularly well known as it was used in the original 1970 version fo the film “The railway Children” (note the DVD from Amazon is the newer film from 2000). After we left Howarth we needed some baby changing facilities, and so stopped at the Morrisons supermarket on Keighley Road, Halifax. We were disappointed to find that this supermarket did not have any baby changing facilities. It is the only major supermarket I have ever been to that hasn’t provided baby changing facilities. We therefore continued our journey stopping at the Sainsbury store in Huddersfield where we use the baby changing facilities and bought our tea. This entry was posted on Friday, June 30th, 2006 and is filed under Babies, General, Tourism. You can follow any responses to this entry through the RSS 2.0 feed. Both comments and pings are currently closed.